The bagel originated in Poland and has been widely consumed by East European Jewish communities since the 17th century. Bagels are now a popular bread product in North America, especially in cities with a large Jewish population. The texture is a dense, chewy, doughy interior with a browned and sometimes crisp exterior. This is one of my husband’s favourite breads because of its chewiness. He likes to buy frozen bagels from the grocery store for his late night snacks. Since, he likes them so much, I thought I would try this recipe from Mel’s Kitchen. This is my first attempt and I am not completely satisfied with the result. There are big blisters in my bagels. However, the bagels still taste chewy as it supposed to be. I tried to search why blisters form in Bagels and from what I could find out, blisters form when there are larger air pockets near the surface, which turns out to be common with hand formed loaves too. 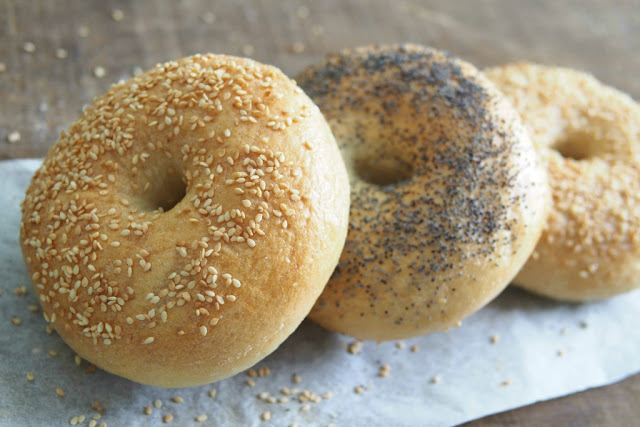 The smooth bagels of the professionals may be due simply to the fact that the machines are able to distribute the gas more evenly through the bagel dough and keep it that way during both kneading and shaping. So it's not a shortcoming, it just means that you are human and not a machine. 1. Combine all of the dough ingredients in the stand mixer bowl and knead on medium-low speed for about 10 minutes. 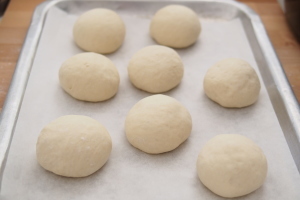 The dough will be stiffer than other soft yeast doughs but will still be pliable and smooth once it has finished kneading. Place the dough in a lightly greased bowl and cover with lightly greased plastic wrap. Set it aside to rise for 1 to 1 1/2 hours. 2. 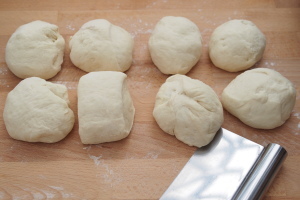 Transfer the puffed/risen dough to a work surface and divide the dough into eight equal pieces. It should be about 113g per portion. Working with one piece at a time, roll it into a smooth, round ball. Place the balls on a lined or lightly greased baking tray and cover lightly. Let them rest for 30 minutes. They’ll puff up very slightly. ￼3. Once they have rested, one-by-one, use your thumb to poke a hole through the center of each ball then twirl the dough and use your other fingers to stretch the hole until it is about 1 to 2 inches in diameter. The entire bagel will be around 4 inches across. 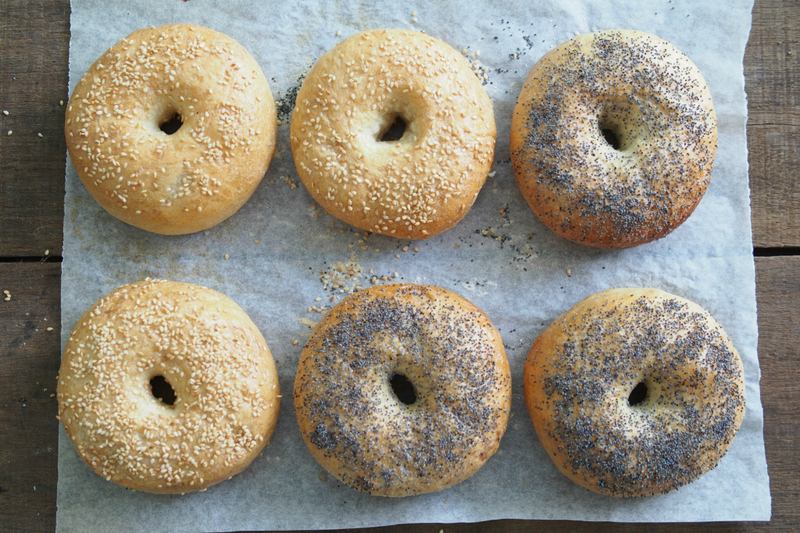 Place the shaped bagels on a lined baking tray (the same one that you’ll bake them on). 5. 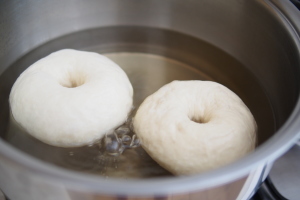 Transfer the bagels, 2 to 3 bagels at a time, to the simmering water. Increase the heat under the pan to bring the water back up to a gently simmering boil, if necessary. Cook the bagels for 2 minutes, flip them over using a wide spatula, and cook 1 minute more. Using a wide spatula, carefully remove the bagels from the water and place them back on the baking sheet. Repeat with the remaining bagels. Note: Some recipes cook only 1 minute on each site and maybe this will make the crust not so chewy. I should try this out next time. ￼6. Top the bagels with your desired ingredients. 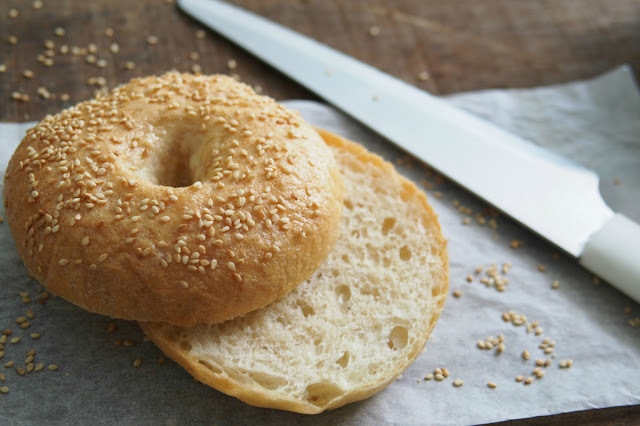 If you are going to use a dry topping, such as sesame seeds or poppy seeds, whisk together 1 egg white with 1 tablespoon water and brush each bagel with the mixture before topping heavily with sesame seeds, poppy seeds, etc. If using Asiago or another cheese, there is no need to brush the bagels with an egg white glaze, simply place the shredded cheese on the bagels. 7. 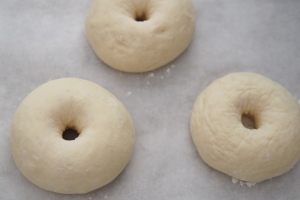 Bake the bagels for 20 to 25 minutes, or until they’re as deep brown as you like. Remove the bagels from the oven, and cool completely on a wire rack.